LÉGER DE LA GRANGE, JEAN, ship’s captain, merchant, and privateer; b. 19 June 1663 (n.s. ), at Abiac, diocese of Limoges, son of Élie Léger and Jeanne Félix; married first to Louise Fauvel (1691), and later to Marie Des Reaux; d. possibly in 1736, in France. 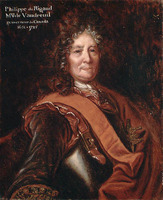 Jean Léger de La Grange must have turned to the sea early, for by 1696 he was commandant of one of Pierre Le Moyne d’Iberville’s ships, the Wesp, in the expedition against the English in Newfoundland. By 1700 he had command of ships of the Compagnie du Canada and at the same time was known as a merchant in Quebec. 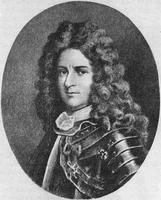 Late in 1703, with business falling off and little to satisfy the need for adventure felt by the youth of the colony, La Grange obtained permission from Philippe de Rigaud de Vaudreuil and François de Beauharnois* de La Chaussaye to lead another expedition against the English in Newfoundland. He interested some merchants such as Nicolas Dupont de Neuville, Louis Prat, and Antoine Pascaud in the venture, and thus bought and equipped two ships; La Grange also found at least 26 men willing to provide their own arms and sign on as crew with no wages but with the expectation of a share in the booty. Morel de La Durantaye and Denis-Joseph Juchereau de La Ferté were part of this crew. One of the merchants, Claude Pauperet of Quebec, and La Grange were to captain the two ships, the Joybert and the Philipeau. La Grange had over-all command. Attacking the port of Bonavista on 29 Aug. 1704 (18 August, o.s. ), they burned two smaller ships and captured the 250-ton Pembroke Galley of London, which was armed but burdened with about 2,500 quintals of dry cod. The attack was bravely but vainly resisted by Captain Michael Gill. The booty was divided up at Quebec, each man of the crew receiving about 40 écus; some cod was sold there to lighten the ship in case of attack en route to Europe. Ironically, the ship was recaptured by the English between Bilbao and La Rochelle after the fish had been sold. La Grange’s daring example inspired Alexandre Leneuf de Beaubassin and others to enter privateering, though none seems to have matched La Grange’s success. La Grange was rewarded with a captaincy in the king’s navy, a rank he held for several years. He is reported to have been at Fort Bourbon on Hudson Bay during the winter of 1709–10. He apparently never served again in Canada and died in France, possibly in 1736. AN, Col., B, 19, f.20; 27, f.94v; 30, f.16; 49, f.162v; C11A, 21, f.50ff. ; 22, ff.4, 71. PAC, FM 6, A 2, 3c (Minutes Rivière et Soulard), X, pp.252–68. 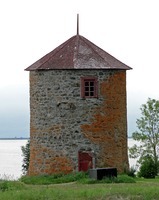 Charlevoix, History (Shea), V, 169–70. “Correspondance de Vaudreuil,” APQ Rapport, 1938–39, 128, 147. [Jérémie], Twenty years of York Factory (Douglas and Wallace). Gagnon, “Noms propres au Canada français,” 119. Le Jeune, Dictionnaire. Prowse, History of Nfld., 239–40. [P.-G. Roy], “Un corsaire canadien: Jean Léger de La Grange,” BRH, XXIV (1918), 33–48, 65–76, 97–104. David Lee, “LÉGER DE LA GRANGE, JEAN,” in Dictionary of Canadian Biography, vol. 2, University of Toronto/Université Laval, 2003–, accessed April 25, 2019, http://www.biographi.ca/en/bio/leger_de_la_grange_jean_2E.html.